Loading of Sulfamic Acid from TITAN UNICHEM. Loading of Sulphamic Acid from TITAN UNICHEM. Protection from sunshine, rain moisture. 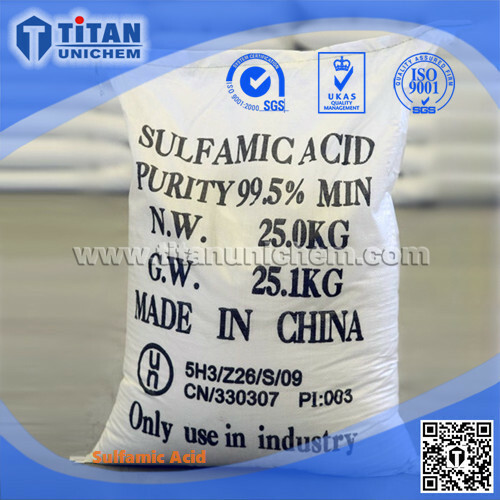 Sulfamic acid is white crystalline solid, it has high stability at normal temperature. Sulphamic acid is freely soluble in water and liquid ammonia, strongly acidic in water solution. Slightly soluble in methanol, insoluble in ethanol and ether. Sulfamic acid is used as metal parts cleaning, getting away oxidize surface. 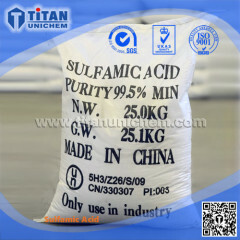 Sulfamic acid is slightly corrosive to metal, used to flush boiler, and sterilize bacterium in water. Bleach fibre, wood and paper. Raw material for pesticide intermediate, ramification of sulfamic zcid.